Asters announced that Oleksandr Onufrienko has joined the team as a partner focusing on private clients practice as of 29 January 2018. 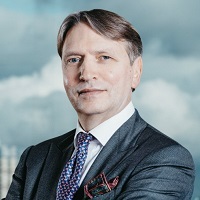 Oleksandr Onufrienko has extensive experience both in consulting business and in investment services, including working for 20 years as head of legal department at KINTO Investment Banking Firm. Mr. Onufrienko has a PhD Degree in Law from Taras Shevchenko National University of Kiev as well as an academic title of associate professor. Within Asters Oleksandr will focus on advising a range of high net worth individuals, investors, family offices, and entrepreneurs on all aspects of private wealth. This will enhance already available strong support of a broad range of HNW clients in areas ranging from real estate, IT, education, and immigration to matrimonial and international tax matters.